The author, standing among his elders. I’ve always been fascinated by the Age of Exploration—a time when men braved their fears and plunged headlong into unmapped landscapes, returning home with stories of strange beasts and curious plants. Men like Hiram Bingham, who discovered the lost city of the Incas; Robert F. Scott, who led a trail-breaking expedition into Antarctica; and of course Lewis and Clark, with their legendary expedition across North America. These days it seems that too many deep jungles and dark forests have been developed, replaced with paved roads and parking lots and cataloged via satellite. But the beauty about trails like Miner’s Ridge is that it proves grand adventures into mysterious landscapes are still possible today—and you don’t even need to leave civilization too far behind to get there. I first heard about Miner’s Ridge Trail in the Prairie Creek Redwoods State Park over breakfast. I was in Crescent City, California, just across Oregon border on a road trip headed south. I mentioned to a local that I was looking to get in a short hike while passing through Redwood Country. He leaned over and told me about his all-time favorite hike, to a remote, untouched place deep in the heart of a redwood forest. I was sold. The trailhead is easy to find right off of Highway 101 following a short bumpy forest road that leads to the Pacific Ocean. Under a canopy of a thick forest on this unpaved road I felt myself slipping away from society. After a few miles the road reaches the Pacific Ocean, and a manned gate that marks the entrance to the park. Shortly after paying the $5 day-use fee I reached the Miner’s Ridge trailhead, across the street from the Gold Bluffs Beach campground. The trail starts on an old logging road through a moss-covered spruce forest, where the ground is thick with ferns and California Redwood Sorrel. Within a mile, I was alone with the trees—trees so big it was easy to imagine that I had been transported in time into a landscape that has no relationship with man. Sure, there was the trail itself, and an occasional short footbridge spanning a creek, but the scale of the place was humbling. The air was heavy with the smell of soil and foliage, and fallen trees lay in shallow graves, covered by moss and canopies of ferns. Along the edge of the single-track trail, I spotted flashes of color among the spectrum of greens: Fernald’s Iris, Creeping Buttercup, Monkey Flower, Redwood Trillium. I rounded a bend about a mile and a half up the trail and came face-to-trunk with a grove of Coast Redwoods. I strained my neck to take in their immensity, their crowns hidden behind a shroud of fog. The Coast Redwoods are the tallest trees in the world, some reaching some 37 stories into the heavens. Unlike most Coast Redwoods, these trees had a ghostly gray bark rather than the earthy red skin of their southern cousins, a quality that makes these giants seem like ancient elders. And ancient elders they are indeed. 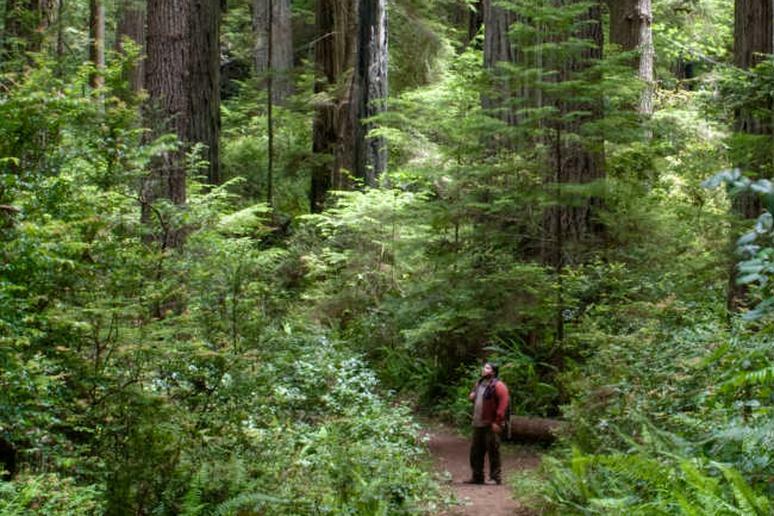 The oldest known Coastal Redwoods are more than 2,000 years old, slowly and quietly growing taller. If these trees could talk, would they have many stories about us? I stood by one of the giants and pondered the thought. In this forest, it is quite possible to follow in the footsteps of the intrepid explorers of yesteryear. Those first western men who laid eyes on this landscape could indeed have laid eyes on the tree in front of me. This is still the land of grand adventure. Miner’s Ridge Trail is 3.6-miles long, and connects to the 4.5-mile James Irvine Trail. The most popular way of exploring the area is by combining these trails into as loop (11.6 miles). Miner’s Ridge Trailhead: From Highway 101, take the Davison Road exit. Travel 5.7 miles west to the Gold Bluffs Beach Campground. Trailhead is 100 yards beyond the campground, on the left. James Irvine Trailhead: From Highway 101, take the Newton B. Drury Scenic Parkway (Exit 753 in the south, not Exit 765 to the north) The trailhead is near the Visitor Center off of Prairie Creek Road.